For the past year, we have been dedicating a whole room to Sunday Night NFL coverage with Redzone and live games on the screens. 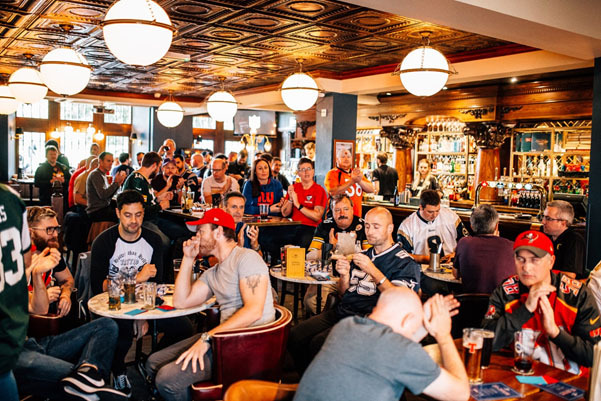 We’ve hosted Edinburgh’s official NFL fan zone every week and we have been lucky enough to host NFL Scotland for a launch Podcast. This was one of our favourite events of the year and included a panel of guests, loads of prizes and most importantly it gathered fans together to help celebrate the NFL kick off. Finally, we’ll be onto the biggest game of the year live from Atlanta. Our event kicks off with an NFL quiz from 9pm. We’ll have a face painter and a competition for the best dressed super fan! It’s an evening not to be missed. For more information, give us a call on 0131 221 5221. If you can’t make the Super Bowl, then keep an eye out for our Official Fan zone which will be back in September for the new season.